Manti Malietau Louis Teʻo (/ˈmæn.taɪ ˈtɛ.oʊ/, MAN-tie-TAY-oh; born January 26, 1991) is an American football inside linebacker for the San Diego Chargers of the National Football League (NFL). He played college football at Notre Dame, where he was recognized as a consensus All-American, received eight national awards, and became one of the most decorated college football players of all time. He was drafted by the Chargers in the second round of the 2013 NFL Draft. One of the enduring stories of Notre Dame's 2012 season was Te'o's strong play following the death of his grandmother and girlfriend, as well as his emergence as a Heisman Trophy candidate. In January 2013, the sports blog Deadspin revealed that the existence and death of his girlfriend had been faked. An acquaintance of Te'o claimed sole responsibility for orchestrating a hoax, assuming fault for luring Te'o into an online relationship with a nonexistent woman. Te'o during 2010 game against USC. Te’o announced on December 11, 2011 that he would return to Notre Dame for his senior season. Te'o entered his final season as one of 10 players in Notre Dame history to record over 300 career tackles and started the season eighth on the career tackles list for the Fighting Irish. During the season, Te’o was the leading tackler and leader in interceptions for a 12-0 Notre Dame team which had the second-ranked scoring defense (10.33 points per game) in the country. He had 103 tackles in the regular season (52 solo, 51 assisted, 8.58 per game), including 5.5 tackles for loss and 1.5 sacks (one for 13 yards of Oklahoma quarterback Landry Jones.) Te’o also led the team, as well as all FBS linebackers in the nation, in interceptions. Te’o’s 7 interceptions during the 2012 season are the most by any FBS linebacker since 2001. He ranked third in the nation at 0.58 interceptions per game, and overall only Fresno State safety Phillip Thomas has more, with 8 interceptions this season. Te'o's season-high per game was 2 interceptions for 28 yards against Michigan. In the BCS National Championship Game, Te'o recorded 10 tackles in a 42-14 loss to a 12-1 Alabama team which won its third national championship in four years. Alabama took control from the start and led 14-0 after the first quarter and extended its lead to a 28-0 score by halftime. Te'o finished with 1 assists and 0 solo tackles. Te'o looked to improve from 2013; however, on September 23, 2014, Te'o suffered a fractured foot. He returned in the middle of the season against the Oakland Raiders. Against the New England Patriots, Te'o intercepted Tom Brady in the red zone, while covering Rob Gronkowski, for his first NFL interception. A few weeks later, in the Chargers comeback victory against the San Francisco 49ers, Te'o earned his first NFL sack by sacking Colin Kaepernick--coincidentally, the first player Te'o tackled in his collegiate career--on a 4th down play. Manti finished the season with 61 tackles, 1 sack, 1 interception, and 3 pass deflections. In 2015, Te'o had 63 tackles, one interception, and one forced fumble. He missed four games in mid-season due to an ankle injury. 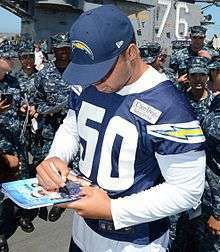 On September 5th, 2016 Te'o was named one of San Diego Chargers Team Captain for the 2016 season  On September 28, 2016, he was placed on injured reserve with a torn Achilles. In a January 24 interview on Katie with Katie Couric, Te'o played three voicemails left by Kekua and said the voice "sounds like a girl", an assessment with which many agreed. In an appearance on Dr. Phil on January 31 and February 1, Tuiasosopo confessed to the hoax; he admitted to falling in love with Te'o and using the Kekua identity as an escape. He also recreated the female voice behind a privacy screen. Relatives of Tuiasosopo, however, told the New York Post that Kekua's voice belonged to Tuiasosopo's female cousin. Despite the revelation that Kekua did not exist, former NFL player Reagan Maui'a said that he twice met someone claiming to be Kekua, and that they had been introduced by Tuiasosopo, whom he believed to be Kekua's cousin. ↑ Manti Te'o. "Player Bio at the Official Athletic Site of the University of Notre Dame". Und.com. Retrieved 2013-03-29. ↑ "Manti Te'o". Athlon Sports. Retrieved 2013-03-29. ↑ "Punahou senior linebacker Manti Te'o receives Butkus Award". Honoluluadvertiser.com. Retrieved 2013-03-29. ↑ "Manti Te'o SN's high school athlete of the year". Sportingnews.com. Retrieved 2013-03-29. ↑ "USA Today tabs Te'o as its best on defense". Honoluluadvertiser.com. Retrieved 2013-03-29. ↑ "Meet PARADE's All-America High School Football Team". Parade.com. Retrieved 2013-03-29. ↑ "Te'o, Funaki top voting of readers". Honolulu Advertiser. January 10, 2010. Retrieved 2013-03-29. ↑ Sondheimer, Eric (February 5, 2009). "Te'o goes to Notre Dame as USC's recruiting gets mixed early results". Los Angeles Times. 1 2 3 4 5 Walters, John. "Manti Te'o: The Notre Dame Linebacker Unplugged". Retrieved 28 November 2012. 1 2 "Manti Te'o Named To The 2010 Bronko Nagurski Trophy Watch List". Und.com. 2010-06-21. Retrieved 2013-03-29. ↑ "Rivals.com 2009 Freshman All-American Team". Collegefootball.rivals.com. Retrieved 2013-03-29. ↑ "Te'o will be focus of defensive revival at Notre Dame". Nationalfootballpost.com. 2010-04-29. Retrieved 2013-03-29. ↑ "2010 Lombardi Award Watch List". Collegefootballpoll.com. 2010-04-30. Retrieved 2013-03-29. ↑ Star, Daily (2010-11-09). "MSU's Jones, ND's Te'o on Bednarik list". The Niles Star. Retrieved 2010-12-27. ↑ Byrne, Pete (December 15, 2010). "Te'o, Ruffer named all-americans". Wsbt.com. Retrieved 2013-03-29. ↑ Clarke, Patrick. "Heisman Watch 2012: Making the Best Case for Each Top Contender". Retrieved 26 November 2012. ↑ Notre Dame Fighting Irish Athletics. "Cumulative Season Statistics". Retrieved 26 November 2012. ↑ Virgen, Steve (December 12, 2012). "Virgen's View: Te'o caps special week in Newport Beach". Daily Pilot. Retrieved December 22, 2012. ↑ "Alabama vs Notre Dame (Jan 7, 2013)". UND.com. Jan 7, 2013. Retrieved 7 February 2013. ↑ ESPN Stats & Information. "Notre Dame concedes very little on defense". Retrieved 26 November 2012. ↑ "Notre Dame Official Athletic Site — Overall Defensive Statistics 2009-2010". University of Notre Dame. Retrieved 2009-10-28. ↑ "Notre Dame Official Athletic Site — Overall Defensive Statistics 2010-2011". University of Notre Dame. Retrieved 2010-09-18. ↑ "Notre Dame Official Athletic Site — Overall Defensive Statistics 2011-2012". University of Notre Dame. Retrieved 2011-10-06. ↑ "Notre Dame Official Athletic Site — Overall Defensive Statistics 2012-2013". University of Notre Dame. Retrieved 2012-09-14. ↑ "Manti Te'o to return to Notre Dame". ESPN.com. December 11, 2011. ↑ Hansen, Eric (January 14, 2013). 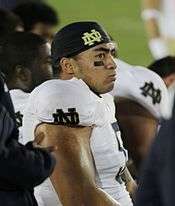 "Notre Dame football notebook: Te'o's draft stock holds steady". ↑ "NFL Events: Combine Player Profiles - Manti Te'o". Nfl.com. Retrieved 2013-03-29. ↑ "Manti Te''o | Notre Dame, ILB : 2013 NFL Draft Scout Player Profile". Nfldraftscout.com. 2006-09-21. Retrieved 2013-03-29. ↑ Battista, Judy (February 23, 2013). "With N.F.L. Watching, Manti Te'o Fields Questions at Scouting Combine". New York Times. ↑ "Manti Te'o: Combine 'exhausting,' he 'can obviously do a lot better'". CBSSports.com. February 26, 2013. ↑ "Manti Te'o runs 40 unofficially in 4.71 at Notre Dame Fighting Irish pro day". ESPN.com. March 26, 2013. ↑ "2013 NFL Mock Draft 4.0". CNN. April 3, 2013. ↑ "Mock Draft Digest: The steady rise of Manti Te'o". CBSSports.com. April 15, 2013. 1 2 "San Diego Chargers select Manti Te'o with sixth pick in second round". ESPN.com. April 27, 2013. ↑ Pelissero, Tom (September 7, 2013). "Manti Te'o's NFL debut postponed by foot injury". USA Today. ↑ "Chargers Sign Former Raiders LB Korey Toomer". Chargers.com. Retrieved September 28, 2016. ↑ "Manti Te'o Sets An Example". Thesantaclara.com. 2012-10-18. Retrieved 2013-03-29. ↑ "Manti Te'o: The Notre Dame Linebacker Unplugged". Und.com. Retrieved 2013-03-29. ↑ "Manti Te'o". Hawaiipreps.honoluluadvertiser.com. 2009-06-07. Retrieved 2013-03-29. ↑ "Manti Te'o - 10 Who Made A Difference". Starbulletin.com. Retrieved 2013-03-29. ↑ "Manti Te'o overcomes tragic loss of grandmother and girlfriend". RantSports.com. October 5, 2012. ↑ Hansen, Eric (16 October 2012). "Manti Te'o: A career that has come full circle". Deseret News. Retrieved 1 February 2013. ↑ Notre Dame Fighting Irish Athletics. "Manti Te'o Press Conference Transcript". Retrieved 28 November 2012. 1 2 3 Burke, Timothy. "Manti Te'o's Dead Girlfriend, The Most Heartbreaking And Inspirational Story Of The College Football Season, Is A Hoax". Retrieved 16 January 2013. ↑ Auman, Greg (17 January 2013). "Q&A with St. Petersburg man who helped break story of Manti Te'o's fictional girlfriend". Tampa Bay Times. Retrieved 17 January 2013. ↑ "Manti Te'o girlfriend hoax: Woman says Ronaiah Tuiasosopo confessed to duping Te'o". Sporting News. 18 January 2013. Retrieved 19 January 2013. ↑ "Photo woman: Tuiasosopo confessed". ESPN. 25 January 2013. Retrieved 15 January 2013. ↑ "Notre Dame, Te'o say linebacker was victim of hoax". Cbssports.com. Retrieved 2013-03-29. ↑ Myerberg, Paul (16 January 2013). "Report: Manti Te'o's inspirational girlfriend story a hoax". USAToday.com. Gannett Company. Retrieved 17 January 2013. ↑ "Notre Dame Statement: Manti Te'o Was Victim Of A Hoax". Retrieved 16 January 2013. ↑ Fornelli, Tom (16 January 2013). "Notre Dame AD Jack Swarbrick addresses Manti Te'o girlfriend hoax". CBSSports.com. CBS Interactive. Retrieved 17 January 2013. ↑ George, Rachel (17 January 2013). "The questions that Manti Te'o needs to answer on girlfriend hoax". USAToday. Retrieved 17 January 2013. ↑ Thamel, Pete (17 January 2013). "Manti Te'o in his own words". Sports Illustrated. Retrieved 18 January 2013. 1 2 Eder, Steve (17 January 2013). "Image Becomes a Puzzle as Theories on Te'o Swirl". NY Times. Retrieved 17 January 2013. ↑ Petchesky, Barry (18 January 2013). "What Did Manti Te'o Say About His Dead Girlfriend After He'd Learned She Wasn't Real?". Deadspin. Retrieved 18 January 2013. ↑ Schwab, Frank (16 January 2013). "Notre Dame stands by Manti Te'o, says he was 'perfect mark' for a hoax". Yahoo. Retrieved 17 January 2013. ↑ Cosentino, Dom (16 January 2013). "Notre Dame: Manti Te'o Was The Victim Of Mean Internet People". Deadspin. Gawker Media. Retrieved 17 January 2013. 1 2 3 "Manti Te'o denies being part of hoax". ESPN. 19 January 2013. Retrieved 19 January 2013. ↑ Russo, Ralph (25 January 2013). "Manti Te'o voicemails aired". The Boston Globe. Retrieved 25 January 2013. ↑ "Manti Te'o to be interviewed by Katie Couric". Associated Press. 20 January 2013. Retrieved 20 January 2013. ↑ "Manti Te'o girlfriend voice at issue". ESPN. 25 January 2013. Retrieved 25 January 2013. ↑ "Hoaxer was in love with Manti Te'o". ESPN.com. ESPN Internet Ventures. Associated Press. 31 January 2013. Retrieved 4 February 2013. ↑ Hansen, Eric; M.L. Nestel; Jeane Macintosh (25 January 2013). "Cousin of Te'o hoaxster revealed as the voice behind fake girlfriend, relatives confirm". New York Post. Retrieved 1 February 2013. ↑ "Manti Te'o girlfriend hoax: Former NFL player says Lennay Kekua 'real,' met her in person". SportingNews.com. 16 January 2013. Retrieved 17 January 2013. Zeman, Ned (Jun 2013). Additional reporting by Jaime Lalinde. "The boy who cried dead girlfriend". Scandal. Vanity Fair. 634: 55–59.